nj arts maven: Help Bring the Urchins to HAM! How many towns the size of Clinton can boast of having world-class public art? How many children can grow up with extraordinary art as part of their everyday experience? Clinton kids can. 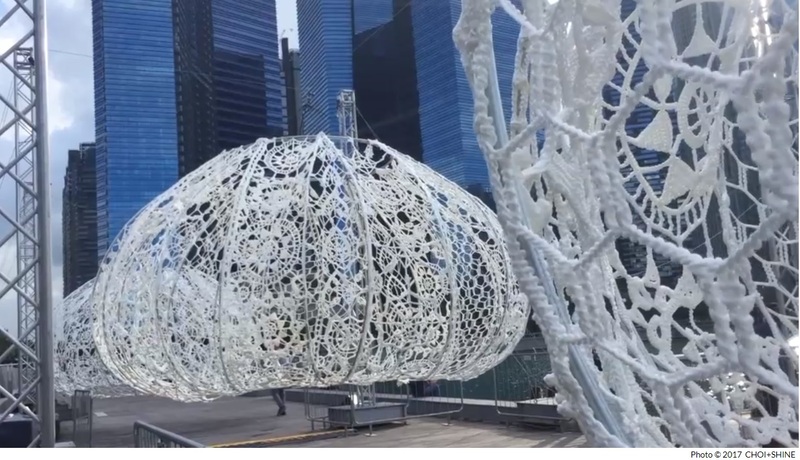 The Urchins, a large-scale outdoor work of art, have made memories to last a lifetime for those fortunate enough to have viewed them in Singapore and Australia. Now, for the first time ever, the Urchins are coming to the United States—to Clinton, New Jersey. The mysterious and beautiful work represents the crowning touch of the nonprofit Hunterdon Art Museum’s, ground-breaking exhibition Lace not Lace: Contemporary Fiber Art from Lacemaking Techniques. You can be a hero and help bring The Urchins to the Art Museum’s Toshiko Takaezu Terrace. We kindly ask you to consider contributing by going to the Hunterdon Art Museum’s page on Kickstarter via this link, and while you're there check out the rewards you’ll receive as our thank you for donating to this project. We're offering tote bags, tickets to a future pop-up dinner, museum memberships and more! Created by architects Jin Choi and Thomas Shine, the Urchins are two lace orbs, each fifteen feet in diameter. Hanging above the Museum’s Toshiko Takaezu Terrace that overlooks the South Branch of the Raritan River, these orbs will be suspended from thin, almost invisible cables spanning trusses that are 20 feet high. More than 50 people dedicated three months to meticulously craft by hand the lace shells that are held in tension over an aluminum frame. Gently guided by the wind and the touch of the visitors, The Urchins will interact with natural light to create ephemeral shadows during the day and glow when illuminated at night. Visitors will be able to interact with the hovering handmade objects, and when they do, become immersed in a delicate layer of lace. Please help us create this once in a lifetime experience by contributing to our Kickstarter campaign today. About Lace Not Lace: Contemporary Fiber Art from Lacemaking Techniques: This ground-breaking exhibition features the work of 28 artists from around the world, demonstrating how lace makers are pushing the boundaries of an art form that has existed for centuries to create fresh and exciting work that explores contemporary themes, materials and forms. In addition to Choi + Shine’s the Urchins, the exhibition also includes Lieve Jerger’s Carriage of Lost Love. Jerger has spent 40 years adapting ancient Flemish lace-making techniques and using copper wire to create a life-sized stagecoach. Artists from South Africa, the Czech Republic and Australia will also be represented in this exhibition curated by internationally known lace expert Devon Thein.